Did you get a turnout muzzle when you adopted your greyhound? Did your adoption group tell you why you have a muzzle? Muzzles are a tool that every retired racing greyhound owner should have. The High Desert Greyt Pack lines up to get their muzzles on when we leave the house or when they are allowed to run on the property (we have almost 2 fenced acres). Why? Because experience is the best teacher. Experience isn’t always from a good experience. We learn more from our mistakes than from our successes. Another scenario that greyhound owners seldom think about: the dogs are running, one trips and squeals. I hope no one ever experiences a pack attack. We adopters tend to forget that they are not people, they are dogs and may behave like dogs if a pack member is injured. It’s not a character flaw, it is who they are and we are responsible for understanding canine behavior. 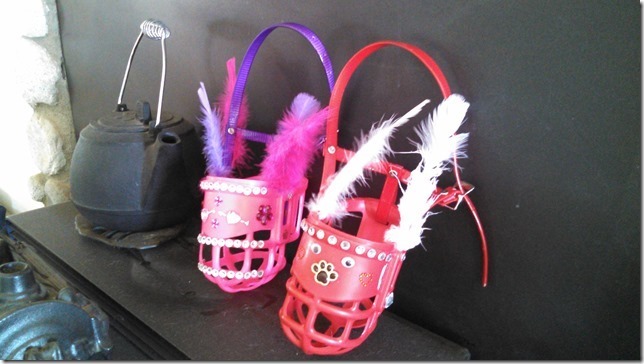 How can this be prevented…..MUZZLES. Then there is the time you leave home and for who knows what reason, could be a disagreement over a bed or a toy, you come home to blood. Those thin skins; those sharp teeth. How can this be prevented…..MUZZLES. The most upsetting incident and the one that occurs more often than you would like to think: The dogs are out in your own yard; there are 2 or more loose dogs outside your fence; those dogs start fighting; you dogs cannot get to the dogs on the other side of the fence and they start going after each other. Are you ready to learn how to stitch up your greyhounds? Do you know how traumatic it is to have to put 28+ stitches into your own dogs? If you are lucky enough to have a vet nearby, are you ready to load your greyhounds in a car; take a chance on you getting bit because the dogs are in pain; get blood all over your car; and then pay hundreds of dollars for a vet bill? How can this be prevented…..MUZZLES. You are taking your greyhounds for a car ride; you make a quick turn or stop; dogs get in each other’s space, and a bite happens. How can this be prevented…..MUZZLES. You are clipping nails and you hit the quick. You hurt your greyhound and his or her response is to lash out at you and you get bit. How can this be prevented…..MUZZLES. This is why I say MUZZLES are your friend. Muzzles are a tool; use it. Not wanting to muzzle your greyhound to prevent injuries is a human perception problem. It is not a problem for your retired racing greyhound. Greyhounds can eat and drink through a turnout muzzle. I’ve even seen them carry fluffy toys around. Also, if your greyhound absolutely hates the ‘cone of shame’, a muzzle may solve the problem. You may have to use a poop guard to keep him or her from licking. Had someone suggest that if your greyhound has access to baby bunnies, etc. when they are outside, a muzzle will protect those creatures. It may also prevent your greyhound from eating things found on the ground that he or she shouldn’t be eating. Like I said, the High Desert Greyt Pack lines up to get their muzzles. And yes, they are happy to get them off when we get home or after a fun run on the property. Sharon Deeringer is a volunteer with the Greyhound Adoption Center in California. 2016 – All rights reserved.